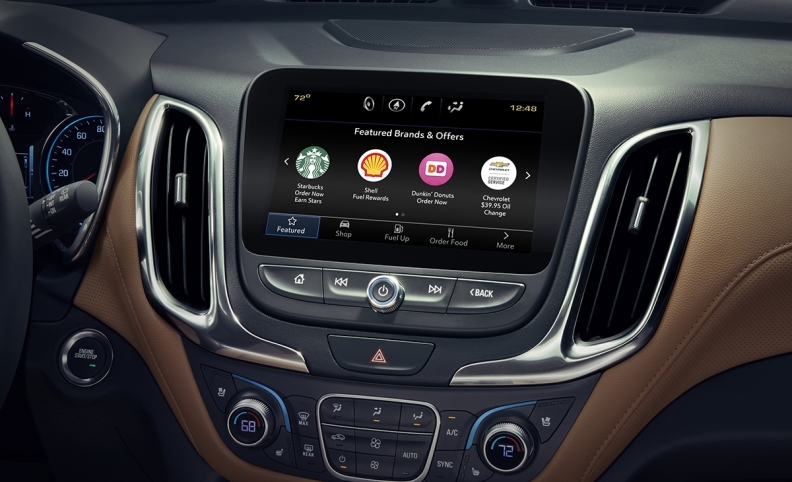 DETROIT -- General Motors is launching a new in-vehicle app named Marketplace in the U.S. that will allow drivers to pay for goods such as gasoline, coffee or food and schedule service through their infotainment systems. "We are using it also to improve how our customers interact with the vehicle and the dealership network," said Santiago Chamorro, GM vice president of global connected customer experience. He emphasized the connections are secure, and Marketplace is not meant to be an in-vehicle digital billboard. Unlike many applications, Chamorro said Marketplace is designed to work while people are driving. In-vehicle marketplaces and app-based services have been discussed for years. Offerings such as Apple CarPlay and Android Auto mirror smartphone apps onto the vehicle's infotainment screens but do not complete financial transactions. GM is remotely sending Marketplace wirelessly to all 2017 and 2018 model-year vehicles equipped with the automaker's new MyLink infotainment system. Owners have to agree to the update, which the automaker began to send last week. A data plan is not required. Some services such as ordering Dunkin' Donuts for pick up require drivers to have an account or profile with the store. Marketplace uses recent and favorite foods and settings from the profiles to customize the offerings for the driver. Deals and membership rewards are currently available from gas stations. Paying for gasoline is expected to be available early next year. "Expect to see more service promotions coming into the platform as we go through very quickly in 2018," Chamorro said. Marketplace also features a "Shop" section dedicated to offers specific to GM vehicles, for instance purchasing Wi-Fi data, discounts for an oil change or deals on GM accessories. GM, according to Chamorro, expects Marketplace to increase customer convenience, which in turn will lead to customer retention. Chamorro declined to forecast revenue projections for Marketplace. He said agreements, which can include revenue sharing with merchants, vary by company. Other current partners with Marketplace include Wingstop, Shell, ExxonMobil, Priceline.com, Parkopedia, Applebee's, IHOP and Delivery.com. Starbucks is expected to be added in early 2018. "We are allowing theses merchants to interact with their customers -- our mutual customers -- in a contextually relevant way," Chamorro said. GM expects the number of Marketplace-capable vehicles in the Unites States to increase from about 1.9 million today to about 4 million by the end of next year.